$39 T-Bone Steak Winter Dinner Special! $39 Buffalo Prime Rib Weekend Dinner Special! Just in time for Halloween, we are enjoying a long-time Fort favorite. Originally served at The Fort in the early 1960s, our Baked Stuffed Pumpkin is similar to a dish once prepared by Native Americans. One of the Three Sacred Sisters (squash), pumpkin was combined with toasted sunflower meal to give the Native Americans’ version of this dish a very distinctive flavor. We suggest complimenting it with your favorite hot sauce, and sharing photos of your version of this autumn comfort food with us on Facebook! Preheat the oven to 350°F. With a large, sharp knife, cut the top off the pumpkin jack-o’-lantern style. With a large spoon, scrape out the seeds and strings (save the seeds to salt and bake for a snack). Rub the inside of the pumpkin generously with melted butter, and season with salt and pepper. Place the pumpkin in a roasting pan. Bake, with the top off, for about 45 minutes, or until the pumpkin is tender, but still holds its shape. Check after 30 minutes for liquid buildup. Using a long handled ladle, remove any juice, and discard. The pumpkin may collapse while baking if you don’t remove the liquid. Meanwhile, in a Dutch oven or heavy-bottomed sauté pan, heat the olive oil. Add the onion and cook over medium heat until translucent, about 5 minutes. Add buffalo/beef and sauté until browned, 6 to 8 minutes. Stir in the corn, green beans, bell pepper, diced chicken, sunflower seeds, chicken broth and peaches. When the liquid comes to a boil, reduce the heat to low, and simmer the stew gently, for about 40 minutes, to blend the flavors. Carefully lift the baked pumpkin onto a round, serving platter. Ladle the stew into the pumpkin and top with the lid. As you serve, be sure to scrape the inside of the pumpkin to mix some of its delicious flesh into the stew. 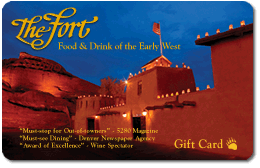 Get Your Fort Gift Card!